I made it back home to North Carolina around 11 p.m. last night. I am feeling quite sleepy today, but I hope some energy kicks in soon because I have a class to teach at the gym at 9 a.m. I’ll be sure to fill you guys in on my chilly and wonderful trip to Minnesota soon, but for now, I just wanted to say a quick hello before the day begins! Ryan and Sadie picked me up at the airport last night and Sadie went a little crazy when I hopped in the car! After almost a week away, I really, really missed those two so much. I think I said, “I love my bed” about 10 times before we fell asleep last night. There really is nothing like the comforting feeling of curling up in your own bed at night, right?! Since the class I’m teaching at the gym today will double as my workout, there was no need to wake up early and I slept in until 7 a.m. and it felt fantastic. I woke up with a grumbling stomach only to stumble down into the kitchen to open a fridge and a pantry that left a lot to be desired. A trip to the grocery store is high my list for today! After snacking on a few handfuls of Moose Munch (breakfast of champions right there), I decided to throw together a bowl of protein oatmeal that I made with almond milk, peanut butter, oatmeal and chocolate protein powder. Served with a juicy pear on the side! The protein powder I used in the oats came from a packet of Tera’s Whey I purchased at Whole Foods a few weeks ago. And yes, that is snow outside our window! It’s currently 14 degrees in Charlotte and though we aren’t supposed to get any snow today, I’m glad some of it decided to stick around so I could see it when I arrived back home. Time for me to change and head out to the gym! I hope you guys have a wonderful Thursday. Thanks so much for stopping by the blog this morning! Love that nail polish! Glad you made it home safe to your little family, that picture of you and Sadie is the cutest! I agree! Sample packets all the way! It’s such a horrible feeling when you buy a big container of something only to find out you don’t like it. Welcome back home and enjoy the snow! 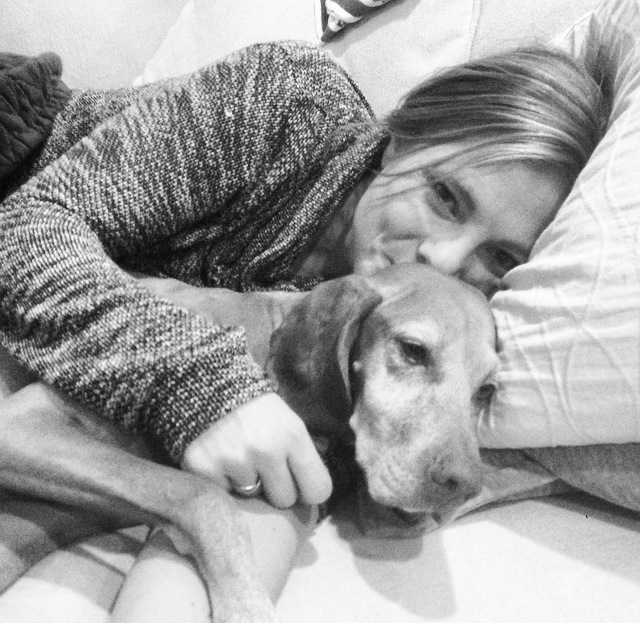 Such a sweet picture of you and Sadie! It is always so nice to come back home after being away. There is nothing better than your dog being so excited to see you come home! I love traveling, but coming home is the best feeling! Can’t wait to hear more about your trip! 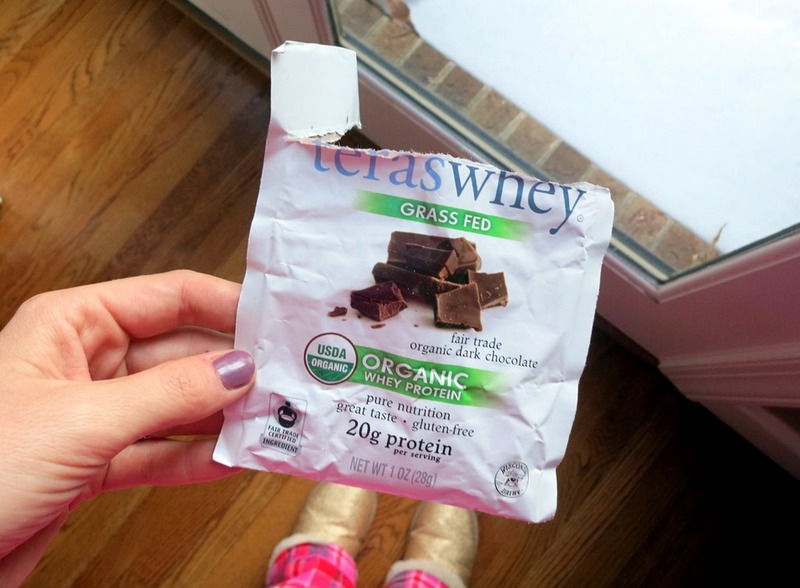 Tera’s Whey is my favorite. I generally buy the unflavored so I can use it for any smoothie. I have bothered the vanilla and chocolate, but they’re too sweet for me. I guess I’m not a fan of stevia. Just a tip, I purchased Tera’s Whey at tj maxx for half the price! Awesome!!!! Thanks for the info! that is definitely the best feeling ever… coming home from a trip and getting back in your own bed! love it! There is nothing like your own bed. The best! Les Mills has been offering free samples of their protein powder on their website for quite some time. Both flavors are awesome! Oooh!! I’ll look it up when I get home and give it a try!! I’ve been traveling a ton lately, so I understand that coming home to bed feeling! Hope you had a restful day! I’m the worst when it comes to buying huge tubs of protein powder only to hate it.. I have a ginormous thing of Cookies and Cream right now. How could that not be delicious!? Where did you get that knit sweater? Love the pattern! I love that picture of you and Sadie! Coming back home after a while away is the best feeling! YAY glad you got to see the snow!!! I totally agree, there is nothing better than sleeping in your own bed after being away for a while. I can’t believe I never thought to buy the sample packets of protein first! hah I just bought a HUGE container of Cookies and Creme protein (because that sounds absolutely amaze balls right?!) and I’m not even sure how I feel about it. I feel like I’m trying to convince myself that I like it, yet failing miserably haha. Glad to see you made it home safely! I wish we had some snow to stick around too….I’m in Chicago and all we have is below zero temps…brrr! I say I LOVE MY BED nearly every single night. Outside of eating breakfast, crawling into bed is my favorite thing to do! Welcome home! Organic and grass fed sounds good! There is nothing like your own bed! Hope you get a few nights running in it! It been so cold here (South Carolina) too!! It’s soooo weird for us! Snow is definitely fun but only for a month or so. Then you can’t wait it to melt! I’m glad you saw some though. I wish more protein powders came in sample packages! I always say sleeping in your own bed and showering in your own shower are some of the BEST things. Love dog cuddles too!! I just had sample packs of chocolate Shakeology! By far my favor chocolate that I’ve tried. How was the Tera’s Whey? Chalky at all? I’m obviously not Julie, but I can say that Tera’s Whey is absolutely not chalky. I love it, it blends so well. 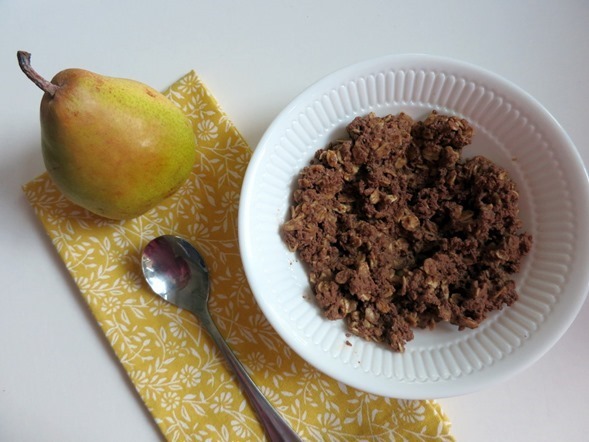 It’s pricier, but with a very clean ingredient list and it’s DELICIOUS. I definitely like protein powder samples. There have been a lot of times when a powder sounds good but then leaves a lot to be desired when I actually have it. I love my bed too! We have a Tempur Pedic which I think may have spoiled us to anything else in the world. I can tolerate other beds, but there’s nothing like coming home to my own! the hubby and 4-legged friend is, in my opinion, the great welcome home committee.